We voted at 6:15 PM tonight. We only waited in line for five minutes. We were shocked at how fast, smooth, stress-free and organized our voting experience was. We heard about the long lines so we were expecting the worst. We were expecting to wait at least an hour. But we strolled right in and were pointed to a line of five people that were designated to our two booths. Hopefully one day, they can offer online voting as an option. 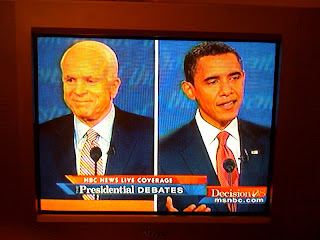 The debates are finally done and one of these men will be announced President of the United States tonight. We hope this election doesn't turn out schiesty like it did in the Bush-Gore election. What is wrong with Florida? In the last election, there were issues of the hanging chad and Bush's brother as governor. Eight years later, they still don't know how to make voting easy for voters. What genius came up with this year's absurd voting ballot in Florida where you have to make a line between two empty boxes where you would normally fill in or check off. There should be a standard ballot that looks the same in every state.